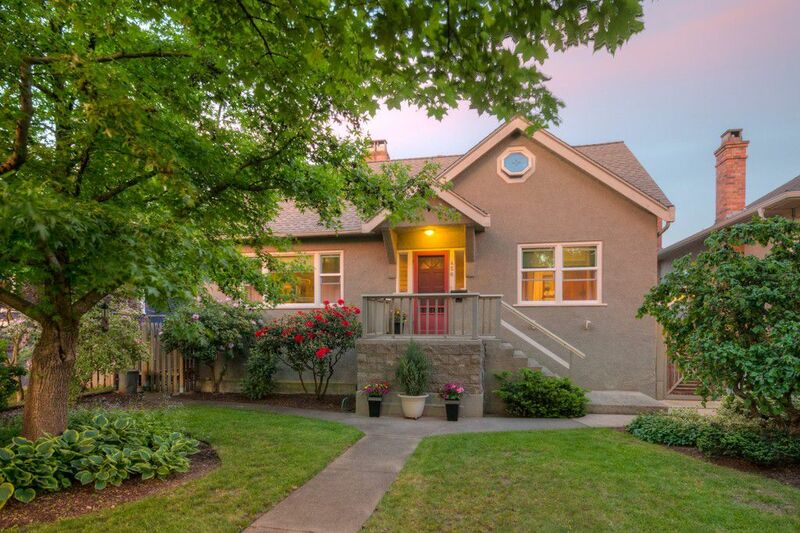 Enjoy the convenient location of this affordable bungalow on one of the nicest streets in Sapperton. Completely remodeled over the last 18 years by its current owners. This proud home is ready for its next 70 years of life. The modern and open floor plan has retained some charming heritage accents. A modern maple kitchen with contrasting countertops stainless steel appliances a gas 5 burner stove and breakfast bar. The dinning room opens onto a 15' x 12' deck over looking the mature gardens with views of the Fraser River and beyond. A open stairs case leads you up to the 2nd level with a good sized master bedroom, strong second bedroom / flex room and a shared 2 piece bath. The basement has a converted studio suite with its own entrance, and a rec-room / 5th bedroom if desired, workshop, laundry and another entrance. Any avid gardener will appreciate the thought that went into the creation of this back yard. three nicely raised garden for vegies and many mature perennials. Walk Score 76!